Main thyroid disorders are hypothyroidism, hyperthyroidism, all kinds of swellings and tumors. Generally, thyroid disorders increase the risk of obesity, heart and vessels disease, anxiety, hair dye, sexual disability and infertility clearly. Patients with these diseases have to be aware of appropriate actions for short or long land, air and sea travels in order to prevent side effects of thyroid disorder. Patients with thyroid disorders are advised to prepare a list of needed medications with help of their physician prior the travel including the dose of the medications and how to bring them, traveling schedule and proper diet planning. Additionally, it is advised to avoid allergens such as fresheners and pathogens such as microorganisms. Taking advantage of destination’s treatment insurance during international travels or special tours for specific patients could diminish the probable costs and increase the quality of treatment services. Bliss RD, Gauger PG, Delbridge LW. Surgeon's approach to the thyroid gland: surgical anatomy and the importance of technique. World J Surg. 2000;24(8):891-7. Jonckheer M. Amiodarone and the thyroid gland. A review. Acta cardiologica. 1980;36(3):199-205. Pemberton JdJ, Black B. Malignant lesions of thyroid gland: review of 774 cases. Surg Gynec Obst. 1939;69:417. Baber EC. Contributions to the minute anatomy of the thyroid gland of the dog. Philos Trans R Soc Lond B Biol Sci. 1876;166:557-68. Ranade A, Rai R, Pai M, Nayak S, Krisnamurthy A, Narayana S. Anatomical variations of the thyroid gland: possible surgical implications. Singapore Med J. 2008;49(10):831. McNabb FA. Thyroid hormones: Prentice Hall; 1992. Smith JW, Evans AT, Costall B, Smythe JW. Thyroid hormones, brain function and cognition: a brief review. Neurosci Biobehav Rev. 2002;26(1):45-60. Joffe R, Sokolov S. Thyroid hormones, the brain, and affective disorders. Crit Rev Neurobiol. 1993;8(1-2):45-63. Zhang J, Lazar MA. The mechanism of action of thyroid hormones. Annu Rev Physiol. 2000;62(1):439-66. Oppenheimer J. Molecular basis of thyroid hormone action: Elsevier; 2012. Weetman AP. Graves' disease. N Engl J Med. 2000;343(17):1236-48. Abraham P, Avenell A, Park CM, Watson WA, Bevan JS. A systematic review of drug therapy for Graves’ hyperthyroidism. Eur J Endocrinol. 2005;153(4):489-98. Vitti P, Rago T, Chiovato L, Pallini S, Santini F, Fiore E, et al. Clinical features of patients with Graves' disease undergoing remission after antithyroid drug treatment. Thyroid. 1997;7(3):369-75. Toulis KA, Anastasilakis AD, Tzellos TG, Goulis DG, Kouvelas D. Selenium supplementation in the treatment of Hashimoto's thyroiditis: a systematic review and a meta-analysis. Thyroid. 2010;20(10):1163-73. Pearce EN, Farwell AP, Braverman LE. Thyroiditis. N Engl J Med. 2003;348(26):2646-55. Nix P, Nicolaides A, Coatesworth A. Thyroid cancer review 1: presentation and investigation of thyroid cancer. Int J Clin Pract. 2005;59(11):1340-4. Dal Maso L, Bosetti C, La Vecchia C, Franceschi S. Risk factors for thyroid cancer: an epidemiological review focused on nutritional factors. Cancer Causes Control. 2009;20(1):75-86. Stagnaro-Green A. Clinical review 152: Postpartum thyroiditis. J Clin Endocrinol Metab. 2002;87(9):4042. Slatosky J, Shipton B, Wahba H. Thyroiditis: differential diagnosis and management. Am Fam Physician. 2000;61(4):1047-52, 54. Humphreys S, Deyermond R, Bali I, Stevenson M, Fee J. The effect of high altitude commercial air travel on oxygen saturation. Anaesthesia. 2005;60(5):458-60. Gavish I, Brenner B. Air travel and the risk of thromboembolism. Intern Emerg Med. 2011;6(2):113-6. DeHart RL. Health issues of air travel. Annu Rev Public Health. 2003;24(1):133-51. Committee BTSSoC. Managing passengers with respiratory disease planning air travel: British Thoracic Society recommendations. Thorax. 2002;57(4):289. Mangili A, Gendreau MA. Transmission of infectious diseases during commercial air travel. Lancet. 2005;365(9463):989-96. EPA Announces New Aircraft Drinking Water Quality Data [Internet]. 2005. Available from: http://yosemite.epa.gov/opa/admpress.nsf/27166bca9a9490ee852570180055e350/4cad7566ca567d3f85256f8e0053ce39!OpenDocument. Woodman J. Patients beyond borders: Everybody's guide to affordable, world-class medical travel: Healthy Travel Media; 2015. Organization WH. International travel and health: situation as on 1 January 2010: World Health Organization; 2010. Izadi M. International travel medicine. Institute of Higher Education Science-Applied Iranian Red Crescent. 2009:289. Hill DR, Ericsson CD, Pearson RD, Keystone JS, Freedman DO, Kozarsky PE, et al. 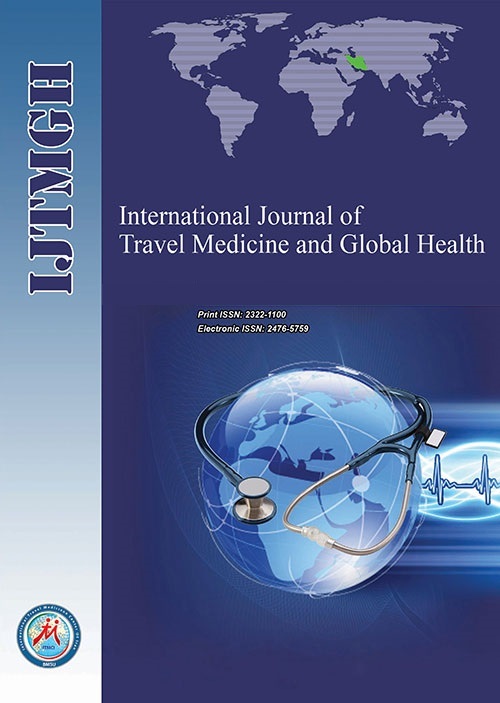 The practice of travel medicine: guidelines by the Infectious Diseases Society of America. Clin Infec Dis. 2006;43(12):1499-539. Uchiyama E, Aronowicz JD, Butovich IA, McCulley JP. Increased evaporative rates in laboratory testing conditions simulating airplane cabin relative humidity: an important factor for dry eye syndrome. Eye Contact Lens. 2007;33(4):174-6. Spengler J, Wilson D. Air quality in aircraft. Proceedings of the Institution of Mechanical Engineers, Part E: Journal of Process Mechanical Engineering. 2003;217(4):323-35. Shupak A, Gordon CR. Motion sickness: advances in pathogenesis, prediction, prevention, and treatment. Aviat Space Environ Med. 2006;77(12):1213-23. Klein AA, Djaiani G, Karski J, Carroll J, Karkouti K, McCluskey S, et al. Acupressure wristbands for the prevention of postoperative nausea and vomiting in adults undergoing cardiac surgery. J Cardiothorac Vasc Anesth. 2004;18(1):68-71. Naumann I, Hogben G. Privacy features of European eID card specifications. Network Security. 2008;2008(8):9-13. Cuthbertson DJ, Davidson J. What to tell patients about radioiodine therapy: Avoid close contact with other people, don't try to conceive, and take your radiation certificate when flying. BMJ. 2006;333(7562):271. Hueston WJ. Treatment of hypothyroidism. Am Fam Physician. 2001;64(10):1717-24. Bahn RS, Burch HS, Cooper DS, Garber JR, Greenlee CM, Klein IL, et al. The role of propylthiouracil in the management of Graves' disease in adults: report of a meeting jointly sponsored by the American Thyroid Association and the Food and Drug Administration. Thyroid. 2009;19(7):673-4. Ruggieri P, Isaacs S. A Simple Guide to Thyroid Disorders: From Diagnosis to Treatment: Addicus Books; 2003. Vrca VB, Skreb F, Cepelak I, Romic Z, Mayer L. Supplementation with antioxidants in the treatment of Graves' disease; the effect on glutathione peroxidase activity and concentration of selenium. Clin Chim Acta. 2004;341(1):55-63. Farhat SC, Silva CA, Orione MAM, Campos LM, Sallum AM, Braga AL. Air pollution in autoimmune rheumatic diseases: a review. Autoimmun Rev. 2011;11(1):14-21. Leder K, Newman D. Respiratory infections during air travel. Internal medicine journal. 2005;35(1):50-5. Beattie S. Thyroid storm: A medical emergency. 2005. Sarlis NJ, Gourgiotis L. Thyroid emergencies. Reviews in Endocrine and Metabolic disorders. 2003;4(2):129-36. Chiha M, Samarasinghe S, Kabaker AS. Thyroid storm an updated review. J Intensive Care Med. 2013;30(3):131-40. Belcaro G, Geroulakos G, Nicolaides AN, Myers KA, Winford M. Venous thromboembolism from air travel the LONFLIT study. Angiology. 2001;52(6):369-74. Kilbreath SL, Ward LC, Lane K, McNeely M, Dylke ES, Refshauge KM, et al. Effect of air travel on lymphedema risk in women with history of breast cancer. Breast Cancer Res Treat. 2010;120(3):649-54. Ward L, Battersby K, Kilbreath S. Airplane travel and lymphedema: a case study. Lymphology. 2009;42(3):139-45. Lopez‐Velez R, Bayas JM. Spanish Travelers to High‐Risk Areas in the Tropics: Airport Survey of Travel Health Knowledge, Attitudes, and Practices in Vaccination and Malaria Prevention. J Travel Med. 2007;14(5):297-305. Duyff RL. American dietetic association complete food and nutrition guide: Houghton Mifflin Harcourt; 2012. Izadi M, Jazayeri SB. Travel medicine: a country-to-country guide: Nova Science; 2013. Rose SR, Keystone J, Kozarsky PE. International travel health guide: Travel Medicine Incorporated; 2001.